INTRODUCTION: Quarks and electrons constitute the fundamental building blocks of matter, but in both cases they can be annihilated into energy as photons, or alternatively energy can create such particles possessed of mass and charge out of the vacuum. This might pose the question as to whether the vacuum, which can be identified with spacetime, is not more truly fundamental than the quanta. A small number of fundamental building blocks comprise the whole of matter known to physics. In the mid 20th century particles originally thought to be fundamental were discovered to be comprised of three particles now thought of as the building blocks of atomic nuclei, and known as quarks. These came to be understood in terms of quantum chromodynamics. While quantum electrodynamics describes the interaction of electrically charged particles, quantum chromodynamics describes the interaction of the strong nuclear force that binds the nucleus of the atom. The proton and neutron of the atomic nucleus are each comprised of three quarks, which come in two types, the up quark and the down quark. 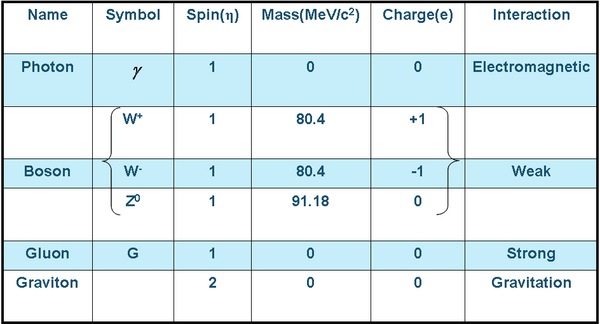 Taking the positive electric charge of the proton to equal one, the up quark has a positive charge of 2/3, and the down quark has a negative charge of – 1/3. Thus a proton containing two up quarks and one down quark has electrical charge of 2/3 + 2/3 – 1/3 = 1. In a neutron there is one up quark and two down quarks giving an electrical charge of 2/3 – 1/3 – 1/3 = 0. The nucleus of the atom as a whole comprises a positively charged proton and an electrically neutral neuron, rendering the nucleus as a whole positively charged. Protons and neutrons are seen to be mainly empty space, with much smaller quarks whirling around inside them. In contrast to the proton and neutron, it is not, as far as is known, possible to break up quarks into still smaller particles. Four more types of quark are known to exist, the strange quark, the charmed quark, the bottom quark and the top quark. These quark only appear in high energy radiation, and do not have a stable existence. The charmed quark can be involved in constituting a very short-lived composite particle comprising a +2/3 charmed quark and a -2/3 antimatter anticharmed quark. Being composed of matter and antimatter, the component particles annihilate one another, in the same manner as colliding electrons and positrons. An interesting aspect of this is that despite the fact that quarks are not known to be divisible, they can still be annihilated to leave just energy in the form of photons. This again seems to undermine the idea of any of the quanta as constituting something truly fundamental. Quarks which carry the colour charge of the strong nuclear force are bound together in such a way as to be colour charge neutral. This is comparable to the manner in which the positive charge of the nucleus and the negative charge of the electrons cancel out, to make the atom electrically neutral. The energy of the binding of oppositely charged quarks increases in line with any separation and eventually the energy associated with this separation creates new quarks out of the fluctuating energy of the vacuum. Once again the true fundamentality of the quanta is put in question, when even the indivisible building-block quarks possessed of mass and two types of charge can be created out of the vacuum. 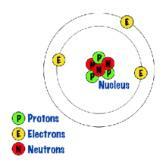 Apart from its nucleus, the atom is also comprised of electrons. Electrons carry negative electric charge, but they do not carry the strong nuclear charge that binds the particles of the nucleus. Electrons are also involved in the weak nuclear force that governs the decay of the nucleus of one type of atom into that of another. This involves the release of an electron or positron. The latter is the positively charges opposite number of the electron, and both belong to the class of particle known as leptons. Quarks and leptons are both classed as fermions, meaning particles that cannot be divided into smaller particles, although they can still be annihilated as energy in the form of photons. Fermions are indivisible particles possessing mass, electrical charge and spin ½. The electromagnetic force and the strong and the weak nuclear force are mediated by bosons such as the photon for the electromagnetic, the W+, W– and Z0 for the weak nuclear force, and gluons for the strong nuclear charge. The superscripts of the weak force bosons refer to their electric charge. These bosons have spins of integer multiples. The interaction of the fermions with the bosons of their particular quantum field are described as vertices. Gluon is in fact a generic term to cover eight different particles mediating the strong nuclear force. The gluons carry that force’s charge, which is known as the colour charge. Each gluon carries a colour positive and a colour negative charge. There are three different types of colour charge called red, blue and green charge, and the different combinations of these charges yields the eight different types of gluon. Colour charge combinations are the only distinction between the different gluons. The superscripts of the weak force bosons refer to their electric charge.